Learn the Secrets to Attracting Your Ideal Clients and How to Avoid the 2 Biggest Mistakes Most Life Coaches Make. PLUS, Discover the 3 Proven and FREE Marketing Strategies That Will Quantum Leap Your Life Coaching Business. The number 1 question we’re asked by our coaching students is: how do I get more clients? Life coaching is a labor of love… but it’s also a BUSINESS. So many coaches are drawn to the field because they LOVE helping people—in fact, in most cases they feel like they’ve been doing it their whole lives! But, in order to turn life coaching into a career, a business, you need to a) charge a reasonable fee for your services and b) have clients. But, this is where many coaches get stuck. The good news is that attracting clients actually CAN be easy and inexpensive (or even free)! The first two are the secrets to offering coaching services that people want to buy. The last two are the secrets to marketing your coaching services. The WHAT is the piece that holds most coaches back. There are a bazillion ways to market coaching services, but without a highly-targeted coaching package no marketing will work. You see, when we first started, life coaching was a new industry and we made a LOT of mistakes. But what we’ve learned in over a decade in the field is that there were 2 MISTAKES that were holding us back. We didn’t see it at the time because all of the other coaches we knew were doing exactly the same thing! Our goal with this program is to help you learn from our mistakes! The #1 mistake most life coaches make is that they try to coach everyone. But, in reality, even if what you offer COULD help anyone, the truth is that not everyone cares. Plus, at a practical level, if you try to market to everyone you’ll reach no one. So, what’s the solution? The first secret to attracting your ideal clients is NICHE COACHING! Instead of being a general coach, focus on a niche that you care deeply about. Niche coaching is focusing is helping your clients achieve a very specific type of goal. Your niche would be based on a specialized type of knowledge or experience that YOU are uniquely able to address with clients. And once you know exactly who you want to be working with, you can market directly to your target market because who know who and where they are! And, this is why we created the Find Your Profitable Purpose-Driven Niche Course (PART 1 OF THE PROGRAM)! You’ll discover how to identify your heart-centered life coaching focus and your tribe of ideal clients, which will allow you to use your unique gifts and experience to make a difference in the world (and get paid for it). Okay, so now you know you need a life coaching niche, but the question is, do you know how to answer the question “what do you do?” If you say, “I’m a life coach” you’re doing it all wrong. You see, the #2 biggest mistake most life coaches make: trying to sell “coaching”! The problem is that nobody wants to buy “coaching”. They want to buy RESULTS! You see, people don’t buy coaching. They don't buy programs or courses. They don't want information or to be told what to do. They never pay for things they SHOULD do. They only pay for things they WANT or NEED. Results-based coaching packages allow you to stop wasting your time trying to convince people to want life coaching! Successful life coaches do NOT try to explain what life coaching is or convince people to want coaching. It’s exhausting and it doesn’t work. The solution is to create a signature life coaching package that is designed to get your ideal clients the specific RESULTS they need. So, now you’re focusing on a topic you love, you know who your target market is, and you’re offering them a product they actually WANT because you’re getting them real results. Plus, offering a coaching package with clearly identifiable outcomes and a focused structure takes the guesswork out of coaching. Both you and your client know what direction you are going and what to do next. In our Create Your Signature Coaching Package course (PART 2 OF THE PROGRAM) you’ll package your gift into a signature life coaching package that gets your clients results every time! You’ll take the guesswork out of coaching AND learn how to develop a series of programs to help clients continue to evolve (and stick around longer) through our unique Client Ascension Process! Marketing is all about communicating the right message to the right audience… so you’ll take what you learn about your tribe of ideal clients and reverse-engineer MARKETING COPY that speaks directly to them and expresses the true value of the results you offer. That’s why we created our Write Epic Marketing and Sales Copy course (PART 3 OF THE PROGRAM) to help you master your message, whether it’s your spiel at a networking meeting or your website copy. But we have good news… marketing doesn’t have to be expensive or complicated. In fact, in our decade of experience and after working with thousands of coaches, we can tell you that the MOST EFFECTIVE marketing strategies for life coaches are both simple and FREE! 1) First, without a doubt, the best way to get your IDEAL clients is to speak in front of them through workshops or presentations. Everyone wants to do business with someone they know, like and trust, especially when they're hiring someone for something as personal and intimate as life coaching. By presenting valuable content that helps get your audience real results, you give them an opportunity to see what you can do for them. 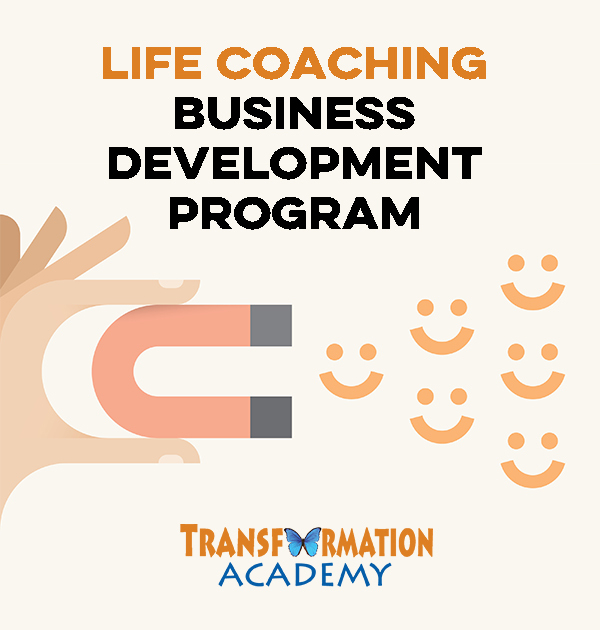 In our Get Life Coaching Clients Using Workshops course (PART 4 OF THE PROGAM) you'll learn how to create your own workshops or presentations using powerful soft-selling techniques that will allow you to offer your coaching program at the end of the presentation in a way that doesn't feel or sound "salesy". 2) Second, the most effective method of gaining access to your target market (whether for a presentation or otherwise) is through collaboration, aka joint ventures. It’s so simple—you do market research to learn more about your tribe. You identify where they already do business. You collaborate with these businesses to offer your coaching to their customers, who are already interested in what you can offer them. It’s a shortcut to getting immediate, direct access to a large number of your ideal potential clients. In our Joint Venture Partnerships course (PART 5 OF THE PROGRAM), you’ll learn how to create powerful joint ventures that take your life coaching business to the next level by capitalizing on other people’s audiences and email lists! 3) Then, what do you do with these potential clients that you attract through speaking or joint ventures? This is where the 3rd marketing strategy for coaches comes in: free sessions! That’s right, the best way to convert an interested potential client into a paid client is to give them an opportunity to get to experience what you can do for them by offering them a free or highly discounted introductory session. This free session is also important for you because it gives you an opportunity to see if this person is a good client for you. But, it’s important to know there is a right way and a wrong way to offer free sessions. That’s why in our Conduct Free Coaching Sessions that Convert into Paying Clients course (PART 6 OF THE PROGRAM) you’ll learn the right way to offer free or introductory life coaching sessions that provide tremendous value for your clients while gently guiding them to want to enroll in your irresistible offer (your coaching program), without feeling pushy or awkward. So, we hope by now you can see that we put EVERYTHING you need to attract your ideal clients and grow your life coaching business in this program! We believe strongly that if you can make a difference in people’s lives it is your MORAL OBLIGATION to let them know! We don’t want you to be another talented life coach that plays small—we want to see you THRIVE and make the difference in the world that you, uniquely, can make! And, so, whether you invest in yourself by taking our courses or seeking your continuing education elsewhere, PLEASE take the next step. Cheers to your greatness and our collective mission to make the world a better place, one coaching client at a time!